While planting season is approaching for many of us, some of you may already be in the fields. Either way, the weather continues to throw curve balls, so it’s more important now than ever to be able to modify your field management plans and change course quickly if necessary. Make sure your Climate FieldView™ account is ready for spring planting season – and beyond. We’ve pulled together some helpful information to help you accurately collect your as-planted, as-applied, and fall harvest data, all of which will help to support the decisions you make throughout the year. To help you get planting off to a smooth start, you will also find instructions on Climate FieldView™ Advanced Scripting and manual scripting tools to help you save time and improve productivity. Accurately collect your field data to measure crop performance. As you prepare your planter for planting season, remember to set up your equipment in the Climate FieldView™ Cab app to ensure seamless and accurate data collection to get your data in one place. To view step-by-step FieldView™ Cab app setup instructions, click here. The Climate FieldView™ Drive transfers data to your Climate FieldView™ account automatically, allowing you to see your field maps being generated in real-time. The FieldView™ Drive is simple to install and is currently compatible with many tractors, planters, seeders, sprayers and combines. John Deere and Case IH adapter cable kits are now available for use with older tractors and sprayers, bypassing the need for a diagnostic port and making it easier to install the FieldView™ Drive. (You can purchase these kits by logging into your Climate FieldView™ account at climate.com.) 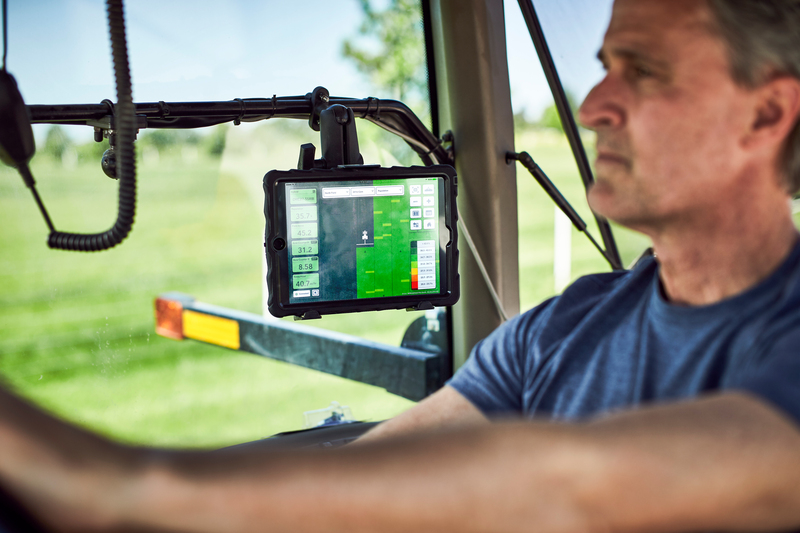 Field data connectivity with FieldView™ is also enabled through Precision Planting 20/20 SeedSense® monitors or John Deere Wireless Data Server (WDS) technology in the cab. For a FieldView™ Drive overview and installation instructions, click here. Get the right field boundaries to better measure performance. Entering accurate field boundaries now will enable accurate data collection throughout the season. You can manage your field list and boundaries for your entire operation by logging into your Climate FieldView™ account at climate.com. Optimize your seed investment with scripting tools. To help you make the most of spring planting, Climate FieldView™ offers two customizable options to generate variable rate seeding prescriptions for your fields. Advanced Scripting (for Climate FieldView™ Pro users only) uses your historical yield data, combined with proprietary field testing results, to help you optimize your seed investment across your operation. For more details on Advanced Scripting, click here. A manual seeding prescription tool is also available to improve your productivity and customize your seeding plan for each field. For step-by-step manual prescription instructions, click here. You can quickly export your prescription to the Climate FieldView™ Cab app, MyJohnDeere, or download when you’re ready to start planting to execute on your equipment of choice. As you prepare for spring planting, remember that help with your Climate FieldView™ account is always just a phone call away. If you have any questions, please contact your Climate FieldView dealer, the Climate Support Team at (888) 924-7475, or support@climate.com.